Roland RD-64: like a normal stage piano, only smaller. NAMM 2013: You can get plenty of 73- and 88-note stage pianos with weighted keys, but 64-note models aren't so widely available. Roland is seeking to fill the gap with the RD-64: a compact stage piano that sports a SuperNATURAL Piano sound engine and various other classic keyboard tones. The streamlined case should make the keyboard relatively easy to carry, and the RD-64 also has a controller mode so that you can use it as the master keyboard in your studio. Get the official word below or on the Roland Connect website. Price and release date are TBC. Stage pianos are usually heavy to carry and awkward to transport - hard work when you play regular gigs. 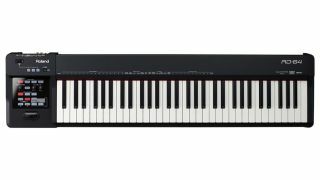 The Roland RD-64 is the solution: a pro-spec stage piano with 64-note weighted-action keys, weighing in at around 13Kg. You also get Roland's sublime Ivory Feel-G keyboard action and SuperNATURAL Piano engine for authentic, playable acoustic piano sounds. It's all topped off with even more SuperNATURAL-based vintage EPs, plus essential clav and organ tones. The RD-64 is also a flexible MIDI master keyboard, with one-touch setup that unlocks the SuperNATURAL sound potential when used with the INTEGRA-7 sound module or JUPITER-80/-50 synths. The RD-64 is a compact, weighted-action stage piano for gigging players. Weighing under13Kg, the RD-64 fits easily in small vehicles and takes up less space on crowded stages. It's also ideal for home studios, teaching labs, and mobile composing. The optional CB-61L Carrying Bag gives durable protection when you're on the move. The RD-64 features Roland's SuperNATURAL Piano sound engine,with inspiring acoustic piano tones plus a selection of expressive electric pianos. The rich, highly-responsive sounds have a wide dynamic range with seamless variations in tone, for pro resultson stage or recording in the studio. A number of clav and organ soundscomplete the collection of essential sounds that fit a wide range of music styles. The 64-note Ivory Feel-G keyboard incorporates Roland's most advanced sensor technology, escapement mechanism, and Ivory Feel construction. This gives you the superior touch, sensitivity, and appearance of the keyboards found in our flagship 88-note pianos, right down to the key material replicating the texture and moisture-absorbing properties of real ivory and ebony. Onboard effects include a high-quality stereo reverb, plus two effects processors tailored to the RD-64's tone categories. Options include enhancer and damper resonance for grand piano sounds, tremolo and phaser for EPs, and many more, with quick on/off access via easy-to-reach buttons. There's even a dedicated rotary effect for the organ, with on/off and speed controls for authentic organ performance. A two-band EQ lets you easily shape the sound via two convenient knobs. Stereo RCA inputs allow you to connect a music player for live backing tracks and rehearsing. Controller mode* transforms the RD-64 into a powerful master keyboard complete with assignable knobs, buttons, pitch bend/mod lever, and the D-BEAM - perfect for controlling synths and other devices on stage and in the studio. The one-touch SuperNATURAL button automatically assigns the RD-64's controllers to use the massive expressive potential of the SuperNATURAL tones in Roland's INTEGRA-7 sound module and JUPITER-80 / JUPITER-50 synthesizers. With a growing number of music apps available, the iPad is becoming increasingly popular for basic music production and on-the-go composing. By plugging in via the optional AppleiPad Camera Connection Kit, the RD-64 becomes a mobile, weighted-action keyboard perfect for use with the iPad giving a luxurious-but-affordable playing experience.